Who knows what characters you might encounter along the way? Just be sure to watch out for the reindeer on the loose and track down Santa’s missing sleigh… silly elf Alfelius Scragmire accidentally left the reindeer stable door open! Find the sleigh before Santa puts poor Alfelius Scragmire on his naughty list this Christmas! The final destination for the elves mission is, Mrs. Claus’s House where there are games and activities for everyone to enjoy! After your visit here stroll on to Santa’s Office at the Old Post Office Sorting Centre. Santa has a special treat for all the boys and girls that help his merry band of elves on their secret missions. Be sure to book in the magical moment to take a picture in Santa’s Sleigh before you leave! Each child’s ticket includes free admission for two adults, a photo with Santa and a gift. Lots for the family to do and see at the Enchanted Christmas event at Winterval! It’s time to put on your bobble hat, wrap up warm and get your skates on! It’s time to put on your bobble hat, wrap up warm and get your skates on! Winterval on Ice will take place again this year at the Gasworks Car Park, Waterside, as part of the Winterval Festival. Best prices are available by pre-booking online and sometimes sell out quickly so advance booking is advised. 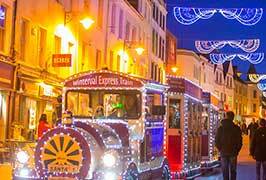 All aboard the Winterval Express Train as it journeys through the heart of the city, and Winterval, along the Mall, past Winterval on Ice, through the Applemarket, and JR Square. For school & group bookings contact 086 8222113. 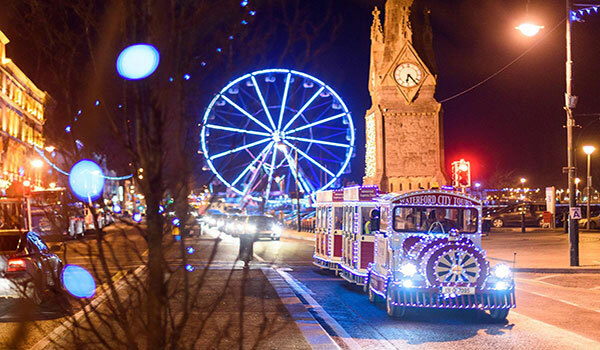 The winterval train departs every 30 mins and operates from 2.00PM – 7:00 PM every Friday and 11.00AM – 7:00PM every Saturday and 12:00PM – 7:00PM on Sundays throughout Winterval. 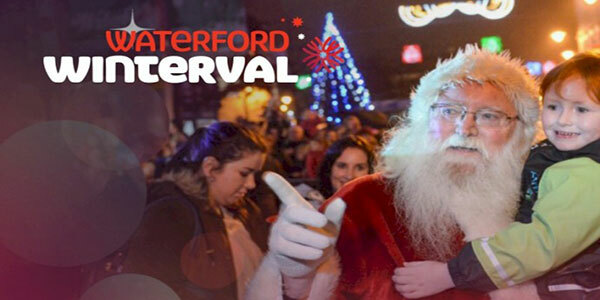 Enjoy a trip across the city and through the heart of Winterval on the festival horse drawn sleigh. On your magical journey take in the various sights and sounds of this wonderful festival. The beautiful double decker carriages are the perfect way to see the lights and decorations and absorb the atmosphere. Choose the luxurious and cosy downstairs or wrap up warm and brave the spectacular birds eye views of shoppers, carousels and stalls. 11.00AM – 6.30PM every Saturday and Sunday throughout Winterval. Each evening in the Christmas market over Winterval, come down to Cathedral Sq for this unique and wonderful festive light show. First show 5pm, then every 30 mins until 8pm. That special magic for which Spraoi are renowned will be on display, with that usual large-scale effect, along with music, lights, sound and spectacle, all transforming the city-centre park into a Christmas wonderland. Journey through time as you wend your way through the Manor St gates in Waterford’s historic city walls, and be transported to a magical land. Based in Waterford, and best known for the annual Spraoi International Street Arts festival, Spraoi is an award-winning street theatre and spectacle company. Spraoi’s Winter Wonderland offers families a free and very special seasonal parkland experience. Don’t miss it! A unique experience at Winterval, this iconic Big Wheel will operate throughout the festival. VIP Experience: €50 for up to 4 persons. For a special occasion choose the VIP group experience. Enjoy warm blankets, complimentary chocolate and prosecco, or non-alcoholic fizz for childrens groups, the perfect way to enjoy the Waterford Eye!